Better Life Blog: new days of prayer cards are coming! So many of you expressed how much you enjoyed the 31 Days of Prayer for Your Husband that I've decided to spend some time working on another set! The basic concept revolves around praying for the different parts of the baby that are developing each week. For example, the week the heart starts to beat, we pray that our little one's heart will come to know and love Jesus above all else. And the week the tongue starts to develop? We are praying for pure speech and encouraging words to flow through it as our baby grows up into an adult. One to two Bible verses accompany each prayer topic. As you can see, these prayers go way beyond "I'm praying for a healthy baby." They lead you in praying for the spiritual life your child. Here is a small sampling of what you can expect design-wise. Images are cropped on purpose - full version will be included in download files. Just like the husband prayer cards, these can be printed at your local CVS or Walgreens just like they were photographs of your family. You can then either slip them into a photo album or make the homemade photo flip book I posted awhile back. I plan on creating lots more of these prayer cards because the response was so overwhelming for the first set. I enjoy making these and especially enjoy spurring you on in prayer. Hey, I can use some accountability and "fun" for my prayer life, too! If you want to sign up for the newsletter that will announce when new prayer card themes are available for purchase and download, please sign up here. 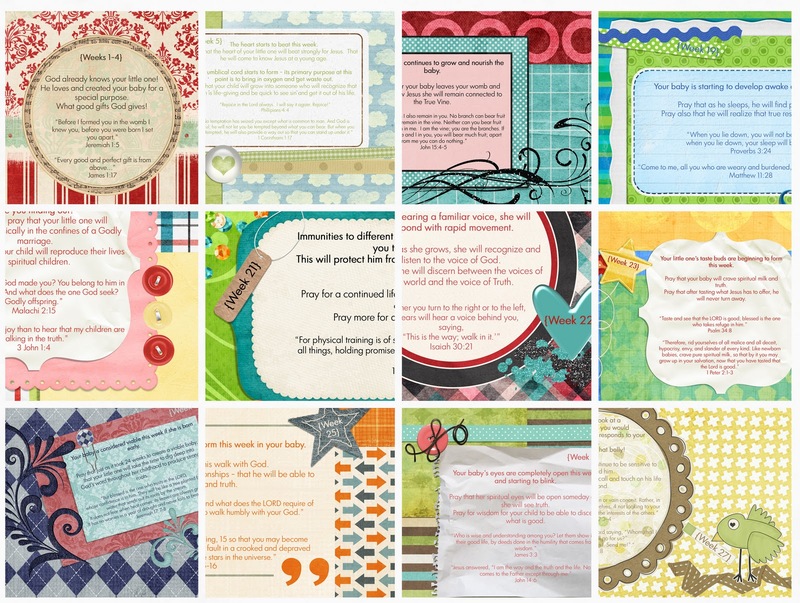 I promise not to clog up your email (that's what Facebook is for), but I will send out a quick update about each new set of prayer cards as they become available. Be looking for these new prayer cards by the middle of October! I'm in the final editing phase. This is the most amazing idea!! I LOVE it!!! Can't wait to get them when they come out.